Last week, I spent some time with Chris Martenson of Peak Prosperity discussing a variety of issues ranging from the stock market to the economy to the debt. As you listen to the embedded interview, I have included the relevant charts to support the points I was making. I have edited down the full transcript to hit the important points, but the full interview is posted at the bottom for your listening pleasure. Chris: Lance, equities in the S&P 500 and NASDAQ within whispers of all time new highs. What are your thoughts here? Lance Roberts: Well, I’ve been writing about this now for the last couple of months that there’s enough momentum in the markets currently that there was a real possibility that we would get back towards from these highs, back from January. Now, mind you, while we’re talking about all-time highs, sounds great. We were here just back in January, so in the last six months, technically, the markets haven’t gone anywhere which is a little bit discouraging simply from the fact that we’re had these blowout earnings over the last two quarters with this caveat: the majority of these earnings, which have been exceptional, no doubt about that, has primarily been due to the substantially low tax rate. Amazon had a blowout quarter as an example. That was due to a 3 percent tax rate. Now, that’s going to start going away beginning next quarter because now the quarter over quarter comparisons become much more challenging. In other words, Amazon’s quarter, next quarter, is going to be based on this quarter, so that growth rate is not going to nearly as large around the corner. So my concern is that while markets have been rallying nicely over the last few months, we’ve set aside trade wars, we’ve priced that in, we’ve set aside Russia, we’ve set aside all these issues on the back of earnings. But that issue of earnings becomes much more challenging in the future. Chris: Well, the earnings are indeed strong. The Wall Street Journal recently had a front page above the fold article that read: Profits Soar as the Economy Accelerates, and then, did note that profits jumped an estimated 23.5 percent in the three months through June. Astonishing. But what was also astonishing, maybe, was that they didn’t mention anything about corporate buybacks in there. They did mention that the effect of the tax cuts and all of that. But let’s talk about the real momentum behind those earnings. They also noted that while the profits were up 23.5 percent revenues weren’t up anywhere close to that. Is that a red flag or not? Lance Roberts: Oh, it’s a huge red flag. Look, at the end of the day, we can manipulate the bottom line of earnings statements all we want. But if I’m a business, look, I run three businesses, and if I don’t have revenue coming in at the top line, I can manipulate my bottom line through accounting gimmicks. I can do some wage suppression. I can layoff all of my employees. I can maintain an illusion of profitability for some period of time, but at some point, I’ve got to have the revenue, which is what happens at the top line of the income statement. And, just to put this into some context, since 2009, now the number I’m about to give you is not annualized, this is total. total growth of revenues for the S&P 500 since 2009 is running about 30 percent in total, right. So total growth 30 percent. Bottom line profitability has grown by almost 300 percent during that same time frame. So earnings per share have grown tenfold over revenue growth because of things like corporate stocks buybacks, because of weight suppression, because of employment suppression, because of accounting gimmicks and the things that we have done. Note: I updated the chart below for Q1 and Q2 (so far) which accounts for a large drop in shares outstanding due to buybacks. As shown, bottom line EPS has exploded by 329% as compared to just a 49% total increase in top line revenue. More importantly, revenue actually declined between Q4 and Q1 despite a surge in bottom-line earnings. Chris: Now, that’s an astonishing statistic of 30 percent growth in top line and 300 percent growth in bottom line. I want to turn now to this idea of corporate buybacks which have been not just a little bit of rocket fuel but breaking all records if 2018 continues as it has for the first six months, just an absolute flood of money coming back in. And the tax cuts were allegedly supposed to be used – the idea was, just the like the one that happened before under Bush – that this money would be repatriated and companies would hire people, pay them more and invest in property, plant, and equipment. Do we have any sign of that, or is this mostly – has that money come home and been used to boost CEO pay packages? Lance Roberts: Well, it depends of what you look at. You know, if you take a look at the mainstream media headlines, mainstream economic data, economic growth 4.1 percent in the last quarter. Great number. Then take a look at wages. We’ve seen a tick up in actual wages. Finally seeing some growth in wages. But the problem is when you look at those numbers at the top line you have to break out what’s happening within the real economy. So, for instance, you take a look at real disposable incomes. Now, what is disposable income? Disposable income is simply, and the way the government measures it, income after taxes. But disposable income for the average American family is what did I have come in the door after taxed versus the bills I have to pay, and what’s actually left over that “disposable” for me to go buy a new Apple iPhone with, as an example. Well, the problem is when you look at the bottom 80 percent of the population versus the top 20 percent, there is no wage perk, and disposable income is absolutely nonexistent. In fact, the average household, to maintain their current standard of living, is running at almost $8,000 deficit every single year which explains why credit card growth is running at rampant paces. And just an article out just yesterday talking about the number of baby boomers now moving into retirement over the age of 65 filing bankruptcy is spiking at very fast levels. Not surprising based upon the fact that this is what’s happening in the underlying situation in America. And any of these economic measures that measure income or net worth, etcetera, it is heavily skewed by the top 10 to 15 percent of the economy which owns almost entirely all the wealth. Chris: Lance, that’s an excellent point. I just got in a little Twitter battle with a Bloomberg journalist who put out an interesting chart that said hey, look, the amount of mortgage service cost for Americans, based on their disposable income, is really at a very low level. And I said, well, hold on, you’re trying to express an average when there’s no average implied here. That’s total disposable income and to total mortgage payments. So if there is any skewing in this data, if all the disposable income growth has gone to the top five percent, that has no bearing on what the average mortgage service cost is going to be. I couldn’t believe that the plummeting and the statistic was huge. It didn’t make sense by anything you could possibly read about actual wage growth. So it’s just those sorts of disconnects are really important to understand. And to me, as I look at this, it’s pretty clear that disposable income, that revision that they just did under that last GDP revision, just really, I thought was one of the most inappropriate revisions I’ve ever seen. Really muddied the waters, I think, for the average reader. Lance Roberts: Two things there, and if anybody actually looked at the data, there were two things that actually occurred there. There was the big – we revised GDP up by a trillion dollars. Well, that was all an inflation adjustment. All we did was change from 2009 dollars to 2012 dollars. What happened to inflation between 2009 and 2012? It went down. So the drop in inflation rate basically revised upward the real inflation-adjusted value of the economy by almost a trillion dollars. Same thing for savings. So when we take a look at the savings rate, savings rate had a big upper revision, and a lot of mainstream media has been coming out and going oh, this is great, look, Americans are just saving more. No, they’re not. The top ten percent is saving more because you’ve had a booming stock market and they’re the ones that own the majority of all the wealth in the country in terms of stocks and investable assists. One of the biggest misconceptions is that everybody contributes to a 401K plan. No, they don’t. Statistic after statistic after statistics shows – even Banger [PH] just came out, and Fidelity both – just came out with recent studies looking at their 401K plans – because they are the two major providers of 401K plans in this country – about 30 percent of the people actually contribute to the plan in terms of the employees, and most of them contribute very little at all to those plans. So the majority of the wealth is held in the top 10 or 15 percent like we just said a second ago. And so the revision to the savings rate was simply just adjusting up to the realization that that’s where the bulk of the wealth is. And that’s due to the booming stock market; that’s due to the Federal Reserve interventions that have been liquefying the markets, global Central Bank interventions, a suppression of interest rates that is inured to the wealth of those at the top 10 or 20 percent. That also goes to wages and executive compensation. When we talked about tax reform a second ago, I wrote article after article, before they even passed tax reform, and said when they pass tax reform the only people that are going to benefit are going to be corporations and executive employees of those companies because of the fact all this money will go to stock buybacks and go to executive compensation through option issuances as well as stock-based compensation increases, as well as salary increase. And that’s exactly where it’s all gone ever since then. So, not surprising. You saw an uptick in the savings rate, but it’s all skewed to the top end. The bottom 80 percent of America, they’re not saving anymore. In fact, statistic after statistic after statistic shows they can’t come up with $500 in an emergency. Chris: No. Exactly. And that’s, of course, where the strength of the economy is supposed to rest if you can wake the slumbering masses up and get them to buy more, that’s where the strength really comes from. CEOs taking home and an extra $10 million doesn’t really move the needle in terms of overall consumption. But let’s talk about this corporate buyback. We never really completed that. I’m looking at a chart right here, right now, of corporate debt. It looks a little exponential to me. You mentioned that growth in top-line revenue of 30 percent over the past decade, I’m seeing a near doubling of corporate debt over the same period of time. They’ve been piling on the debt, and all I ever read about in the media is about their cash hordes. For example, Apple. Hey, they’ve got $240 billion in cash. Yeah, they also have $220 billion in short and long-term debt. Where do you look at the corporate debt cycle as far as where we are in this cycle? Lance Roberts: It doesn’t really matter how you break it down. Corporate debt is an important point, but if you look at margin debt in terms of investors and how much leverage they’re carrying within the market – take a look at household debt; take a look a government debt. We’re at record levels on debt across the board. In fact, I run a chart every now and then that shows what I call total system leverage. 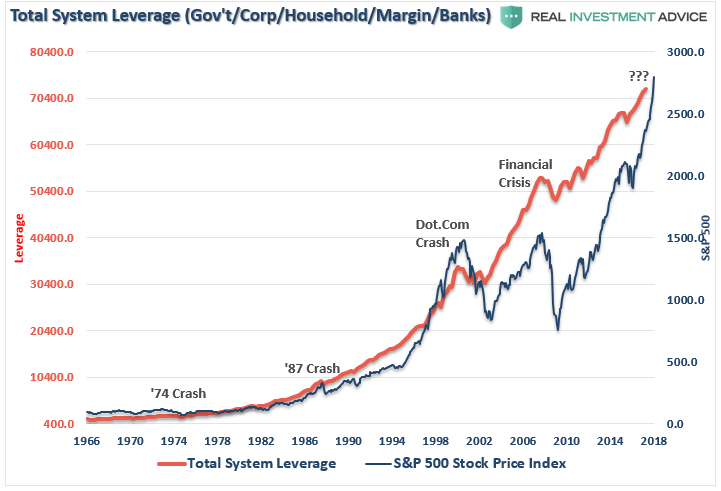 And what total system leverage looks at is all the debt; government, marching [PH], corporate, personal debt, all put into one indicator. And we’re talking in excess of $120, $130 trillion of total debt outstanding right now relative to an economy that’s growing at $20 trillion. Note: The chart below is total system leverage excluding the $40-50 Trillion of unfunded liabilities of social security and Medicare. So this is, of course, the highest level ever on record, and the impacts of this have been a function – and back to your corporate debt question – corporations have, of course, they’ve used ultra-low interest rates to lever up balance sheets to pay out dividends, to do stock buybacks, etcetera, and a lot of these stock buybacks that have been done have been done through corporate leverage because it was a better use of capital; I get to write off the interest on my balance sheet in terms of what I’m borrowing on the debt plus the buyback shares and improve my bottom line earnings. That’s been a win-win for corporations. The problem, though, eventually is that a lot of this debt that’s been issued is sub quality credit in terms of investment. 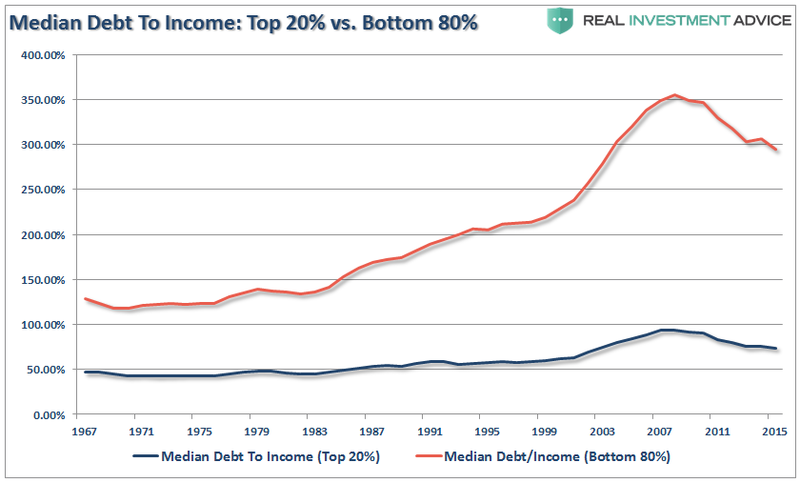 When you talk about investment grade investment, BBB or better, a lot of this debt that’s outstanding is BB or less. And that’s going to be an issue when two things occur: one, when interest rates rise enough that the cost of borrowing is no longer acceptable and two, when you have the next major market crash that causes a massive deleveraging cycle in the markets, and that will be triggered by an increase in interest rates from the Federal Reserve. Lance Roberts: And not only that, and I don’t want to get off into a big pollical bend here, but if you take a look at how the government has kind of been staked with players, really since the current administration has come in, these are a lot of the old guard guys: Wilber Ross, Navarro, Kudlow, etcetera, these are all Reaganites. And they have this strong belief that they can reignite the Reagan years by doing trickledown economics. The one thing that all of them have missed, along with the mainstream media and the majority of the mainstream analysis is this ain’t Reagan. 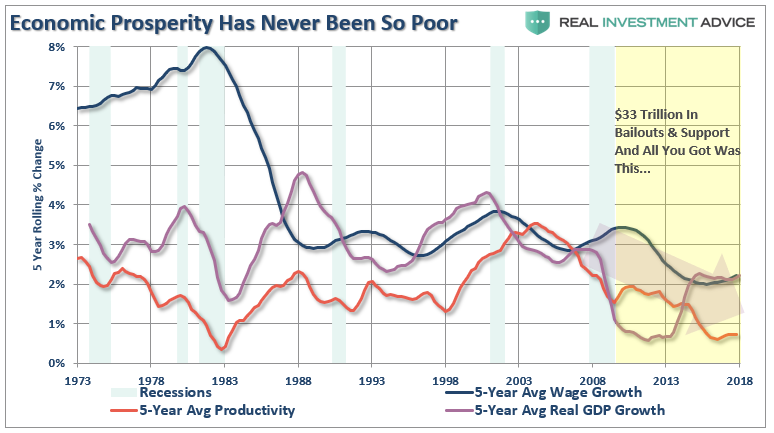 We’re not in an economy of the Reagan years. 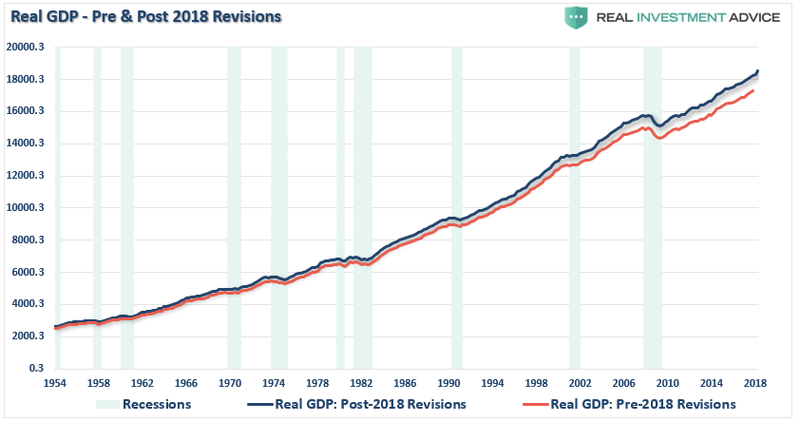 Remember, Reagan started, when Reagan went into office he was coming out of a double back to back recession, just coming off the back of a major 1974 bear market crash where valuations were down to six and seven times earnings. Dividend yields were at 6 percent, interest rates were 14 percent, inflation was 14 percent. That was falling. Valuations were low and beginning to rise. Dividend yields were high and, of course, economic growth was already running at 6 percent. You don’t have that environment today. So there was no way that “trickle-down Reaganomics” is, or will, work in the current environment. So you can slash taxes; you can do the things you want to do; you can do trade wars and tariffs, but all you’re going to do is negatively impact the economy because of the fact we’re running $21 trillion in debt, we’re going to run a trillion-dollar deficit by the end of this year, that’s going to become two trillion over the next five years. And the growth trajectory of debt and, of course, where we are in terms of economic growth, that will only substantially go lower by next decade. Chris: Let’s talk about bonds now. What sort of signals are bonds sending? I note that you’re looking at some technical signals that might say lower bond yields on the say? Lance Roberts: A couple things. Let’s remember that interest rates are a function of the economy. So Jamie Diamond out yesterday saying that interest rates should be 4.0 percent, and they’re going to 5.0 percent, so get ready for higher yields. That sounds great. Sounds fantastic. The problem is that if you go back through history there’s a very high correlation between interest rates and economic growth. Surprise. If interest rates are rising that means the cost of borrowing is going up, and that means that as a consumer I have to make a decision. So I want to buy a house or I want to buy a car or I want to finance some type of product that I want to buy, I look at the payment, and if they payment fits within my budget then I’ll buy it, I’ll finance it. I’ll buy a car, I’ll buy a house or finance a new iPhone at $1,000; that’s about the only way people can afford it these days. So I’ll finance it. But if the interest rate goes up on that to a point to where I can’t afford it within my budget, well, I either have to buy something else at a much lower price or I postpone the payment. And, of course, as interest rates go up, this specifically works to slow economic activity. That’s why the Federal Reserves lifts interest rates. Why do they lift interest rates? They’re not lifting interest rates because they expect the economy to boom from this, they’re actually trying to slow economic growth to quail inflationary pressures. That’s why we lift interest rates; it increases the cost of borrowing. The problem is that we’re not in an environment currently, economically speaking, to support higher interest rates. See, back in the 40’s, 50’s, 60’s, and 70’s, you can look at that period of time and look at economic growth. Economic growth was rising during that period. So quarter over quarter, year over year, economic growth was increasing because, remember we were coming back from World War II, we have bombed out the entirety of the rest of the known world and Europe and everywhere else, and we were helping them rebuild manufacturing. We were industrial power housed in America. We were manufacturing and rebuilding the rest of the world. As a function of that activity, that increase in productivity, that increase in output, we were growing our economy. So, as a function of that, as the economy was growing, interest rates were also rising because individuals were making more money, they were saving more, productivity was going up, economic growth up which means that we could sustain higher levels of interest rates. There’s a relationship there. Beginning in 1980, we reversed our economy and moved from a manufacturing base to a servicing base which has a much lower output. Inflation and interest rates were under attack by the Federal Reserve, and they had begun this long trend lower. 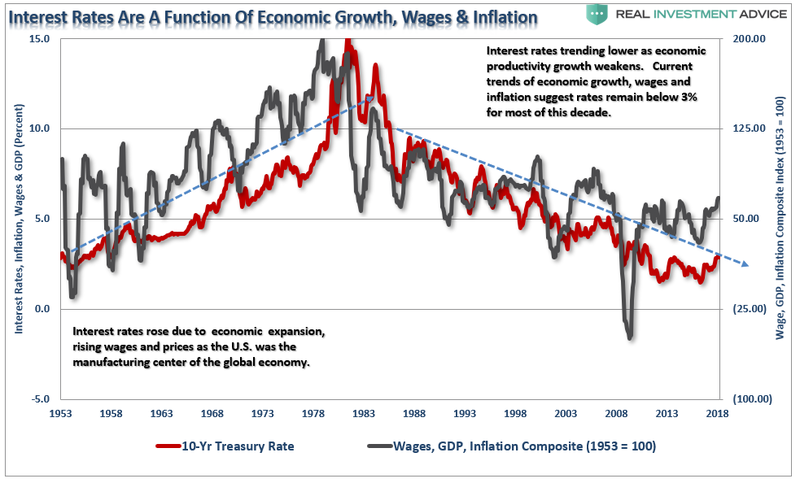 And, as a consequence, interest rates have followed the rate of economic growth which has been lower. The annual rate of economic growth back in the late 70s, early 80s, was between 6 and 8 percent. We’re at 2 percent today. And that’s been declining substantially every single decade over the last forty years. And here were are today at roughly running 2.0. 2.5 percent, which means that interest rates on the ten-year treasury should run 2.0, 2.5 percent. Not 4.0, not 5.0 because you don’t have economic growth on sustainable basis running at 4.0 or 5.0 percent. Inflation, interest rates, wages and economic growth are all pretty much tied to it because they are all part and parcel built on one thing, the consumer, which is 70 percent of the economy. Chris: Wouldn’t that make sense? And I’ve often been critical of the Fed by saying that they are not this magical, wealth-creating body. That’s not what they do. They’re a wealth redistribution body. They take from the bottom to the top, but they did something else too. Let me get your thought on this. They steal from the future and bring it to the present. Lance Roberts: Yes. And that’s exactly what quantitative easing does. When you do anything, suppress interest rates, when you do anything like adding more liquidity to the market – so, in other words, for the average American, we don’t save any money. We know that. So if I give you – this is the whole myth behind giving people a payout or doing some type of government bonus to Americans. It would be great. We could give every American in this country $5,000 today and they would all go out and spend it today, and then the benefit is over, and you’re right back to where you were before because you’ll create these little short terms pops in economic activity by doing things. But unless you create a sustainable rate of wealth growth, in other words, helping people grow their wealth by giving them jobs and higher wages and these types of things – I’m talking about real employment. I’m not talking about employment at the rate of population growth which is all we’ve had since 2009. Since 2009, we’ve created roughly about 20 million jobs, the economy has grown by 23 million working age Americans, so there’s still about a six to eight-million-person gap between just the people entering the workforce and that people who are getting hired. And this is when we take a look at all the employment statistics; employment to population ratios at the lowest levels since 1965, and they go well, that’s the baby boomers. Okay, fine. Let’s strip out everybody over the age of 55, let’s assume we went “Logan’s Run” way and they were just all eliminated – if you don’t know what that reference is, look it up on the internet – it’s from the 1970s – it for old people who remember. Lance Roberts: I know you do. And if we take out all the people under the age of 24. So let’s just – they’re all in school. Okay, so fine. We’ll take out everybody in the workforce under the age of 24. Why is it that 24 to 55-year-old, that population, only 50-percent of them have full-time jobs? I mean, that’s what’s happening in the economy. And you can’t create economic prosperity when you have real unemployment still at much higher rates then what the government statistics would suggest. But, again, doing any type of activity where I give you a benefit, I give you ultra-low interest rates, zero percent financing, if you’ll come buy a car today. Hey, I’m there. Right? But ultimately, I have got to make the payments. And while I can create short term incentives to pull forward future purchases, in order to create sustainable economic growth, I need to focus on creating the ability to consume more in the future because I have more money with which to consume. Chris: Indeed, the statistics show that we’ve had what we would call sub-par growth for well over a decade now. And from my standpoint this all makes a lot of sense because you have to understand the role of debt in that story and you have to understand the role of energy in that story. So I have a story that says yeah, sub-par is the new normal, and that’s just something that we have to get used to. But the Fed is trying to recreate conditions as is sub-par wasn’t the new normal. They want the 50’s and 60’s to reemerge. Not going to happen. So you’re saying – the summary of that, one summary, is that interest rates could fall from here, and they should fall if they’re going to match the level of economic activity. But let me take a devil’s advocate on that. You said the magic thing before which was a one trillion-dollar Federal deficit going to two, isn’t that an upward pressure on bond yields potentially? Lance Roberts: Look, there’s the fundamental backdrop and then there’s the technical backdrop. Okay. So the fundamental backdrop, and this is the belief right now, and we’re about to do this, right – we haven’t had a budget in ten years with our federal government. The end of September is the end of the 2018 fiscal year, and we’ve passed two continuing resolutions last year of roughly about two trillion dollars all together to fund last year’s spending. We’re going to have to pass another continuing resolution by October the 1st to fund the 2019 fiscal year. That’s already estimated in the first round, which will not make it the entire fiscal year, mind you – it’ll make it about six months – is $1.3 trillion. Well, that means this is new debt to be issued by the government. That means that people are going to have to buy them, and the concern is right now there’s simply not enough people to buy that debt. China is not buying as much debt as they were, and of course, the Federal Reserve is not buying bonds at this moment. In fact, they’re trying to reduce their balance sheet – they’re selling $50 billion a month. But yet the ten-year treasure rate remains below 3.0 percent, now, along with other factors that suggested that’s going to be the case. But, technically, interest rates are at a level that have historically, whether you look at it on a weekly basis, a daily basis, a monthly basis, a quarterly basis or an annual basis, interest rates now, and this goes back into going back the 1940’s and 1950’s, when rates were rising and economic growth was rising. So it doesn’t matter whether economic growth and rates are rising or falling, but it does show that every time that interest rates technically – now look, this is just technical – this is just the function of rate movement – technically, every time rates have been this over bought historically on any measure of time-frame, it has denoted a peak within the economic cycle and has also denoted a peak within the financial markets. And it doesn’t mean that the markets always crash, although they did something, but it also meant that we had periods where they stuck exceptionally low. And, more importantly, rates fell. So how do those two marry up? How does this fundamental backdrop marry up to the fact that technicals are suggesting an entirely different outcome which would suggest that yields are going to fall? Let me tell you how I think it plays out and why I think that the technical may be right over the fundamental view for now. The first reason is that interest rates are rising in an environment where we have slower economic growth and we are ten years into a stellar stock market run that has been fueled by a lot of artificial stimulus. 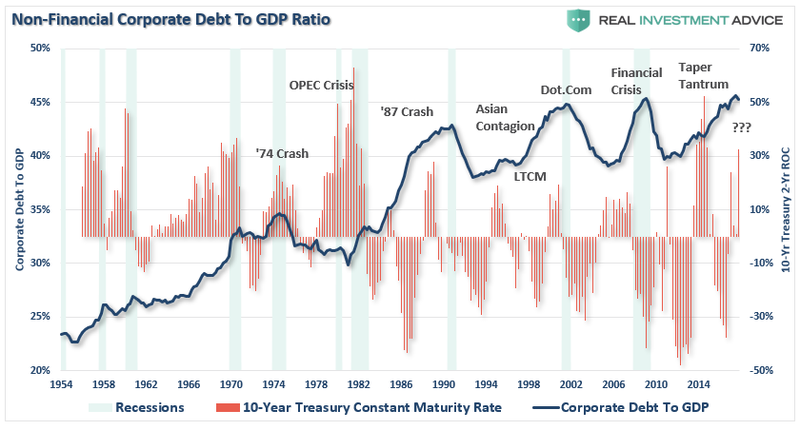 I don’t know what will be the cause or the catalyst, but as you mentioned before and we talked about, we have debt leverage and speculation at the highest levels on record. I’m doing a chart right now for an article I’m writing for Thursday showing household equity ownership is a percentage of total net worth. Any time that number is above 40, which right now we’re at 42.3, it has equated to a very not good outcome for investors in the financial markets. So what would cause rates to fall despite the fact we’re having record treasury issuances? That would be a major event within the financial and/or credit markets. Now, I don’t know what it’ll be. I can’t tell you whether it’s going to be an Italian blow-up or something in America or mortgage crisis. You won’t know until it happens. Just like we didn’t know about the financial crisis until Lehman popped up. We don’t know what the trigger will be. We know we have all the ingredients. You and I talked about this previously. We have all the ingredients from leverage and speculation in place, but all we’re missing is the match to light the fuse. And whatever that catalyst is will create an environment where QE4 will come from the Federal Reserve, the bond buying will come back in as a flight to safety. Now, let me be really clear – when I’m talking about interest rates we are only talking about U.S. government treasuries because the place you do not want to be is in corporate bonds, high yield debt or any other type of state and local government issued debt, municipalities, etcetera because one of the big factors coming up in the next crisis, no matter what it is and what causes it, will be a devastation of U.S. pension funds which have a $5 trillion hole sitting there, and they will not be recoverable this time around, even with a bailout. The pension system will come crashing down if that even is severe enough to trigger that because they are so underfunded now and are so dependent upon 7.0 annualized rates of return that another big drawdown at this point, after two previous ones, will provide a scenario where they cannot get catch up. Period. Chris: Excellent. Talk to you next time.